Edited August 18: Welcome to everyone coming over from The Nester's Mistreatment Party! 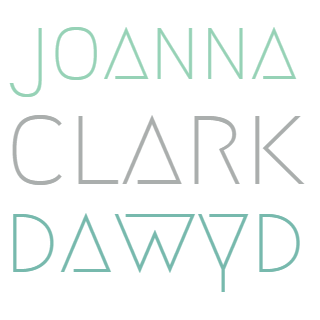 If y'all are interested, today is the last day to enter my giveaway. Now here is my first window mistreatment! 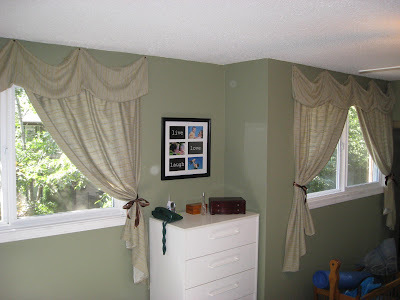 Remember those boring curtains that I made for the bedroom and then hated? Well, I finally fixed them, and now I love them! I decided to completely remove the rods and just use upholstery tacks. I couldn't be happier with the result. I think The Nester should write a book about mistreating windows. It would be a best seller. In fact, she could even have a TV show with the tag line "It doesn't have to be perfect to be beautiful". This is step one. 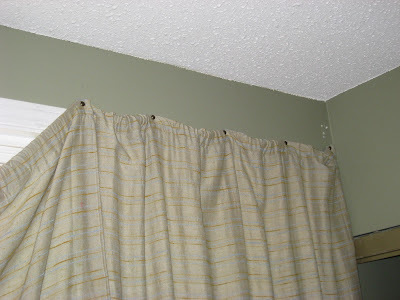 My hemmed, and properly-made (sort of) curtains thatI hated. I took the rod down, and tacked them up just above the trim. After adding the leftover fabric on top (which I did not hem or even iron), and of course my satin ribbon tiebacks (brown because our bedding is brown)... Ta-da! The room is so much brighter now that I have a way to keep the curtains open. I don't quite hate my bedroom as much as I used do. The wonders of upholstery tacks! Agreed, upholstery tacs RAWK (so does Nester). 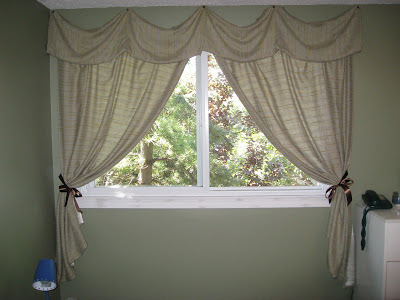 Your curtains look great! I like your wall color, also. Oh la la!! Very nice!!! Love the wall colour!! What colour is it? I love what you did, the color/contrast is fantastic! Ok girl, you are wearing me out with all of these projects! I'm gonna start calling you the Energizer Bunny! 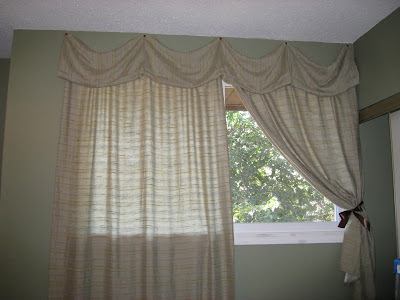 These curtains look amazing!!! I love them!! I also love the wall color in your bedroom- please share!! Oh you have got my curiosity going now- I wanna see the rest of the room!!!! Those look FABULOUS....great mistreatments!! I have some upholstery tacks that I haven't tried yet...I think I am fabric challenged!! I think you made the curtains look nicer with all that mistrearment you did. I also agree that Nester could have a TV show. 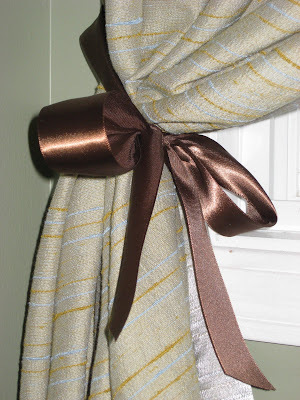 everything looks better with chocolate brown ribbons! I love the addition of ribbon! Love the improvements that you made! Those look great! Great mistreatment and I love the brown ribbon with them! So pretty! Thanks for visiting me today, too! Very nice. Yes, I would love to know the wall color! !